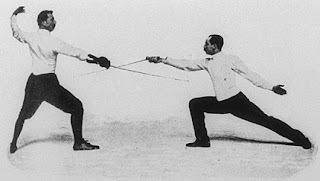 The Olympic fencer Italo Santelli, who famously fought a duel with his former team captain over a matter of honour, died on this day in 1945 in Livorno, Tuscany. 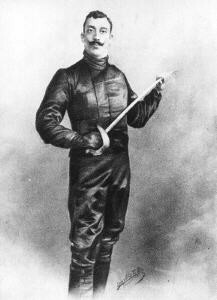 Santelli won a silver medal at the 1900 Olympics in Paris with a new style of sabre fencing of his own invention. Originally from Carrodano in Liguria, he fought for Italy but spent a large part of his career coaching Hungary, who he helped become a formidable power in fencing. It was this conflict of interests that sparked an incident at the 1924 Olympics, also in Paris, that led to Santelli and Adolfo Cotronei, who was Italy’s team captain, engaging in the infamous duel. It happened during a match between the Italians and the host nation France in the team foil event when Italy’s Aldo Boni was facing off against Lucien Gaudin. With the match tied at four touches each, the Hungarian judge György Kovacs awarded the winning fifth touch to Gaudin, a decision that sparked immediate consternation in the Italian ranks. Boni rounded on Kovacs, delivering a verbal tirade. But it was in Italian - beyond the official’s comprehension. It just happened that Santelli, in his capacity as Hungary’s coach, witnessed the whole dispute and was asked to step in as interpreter. Santelli’s translation did not reflect well on Boni, who was asked to apologise for insulting Kovacs. When he refused, Italy were disqualified and the event ended with France winning the gold, with Belgium taking silver and Hungary the bronze. That seemed to be the end of the matter until, on the team’s return to Italy, the captain Cotronei, who was also a journalist, wrote an article in which he alleged that Santelli had deliberately portrayed Boni as the villain on the basis that if the Italians were eliminated, his own Hungary team would have a better chance of finishing in a medal position. Santelli was outraged but the bullish Cotronei stood by his article and, although accounts vary as to who challenged whom, it was somehow agreed that the two would engage in a duel, a dispute-settling method that had been outlawed in many other parts of the western world but was still part of Italian culture even in the early part of the 20th century. Legislation was being drawn up to ban the practice in Italy - driven by Benito Mussolini, then still Prime Minister rather than dictator - but special dispensation was obtained to allow this one to go ahead. Thus the the stage was set for a date in August for the two to face each other with sabres in the town of Abbazia, a town about 70km (43 miles) southeast of Trieste that later became Opatija in Croatia but was then on Italian soil. In the event, Cotronei had to take on not Italo Santelli but his son, Giorgio, another fencer, who had invoked a rule under the 18th century Code Duello that allowed him to substitute for his father, who was keen to defend his honour but was by then in his 61st year. It was not a fight to the death, thankfully, but blood needed to be drawn for a winner to be declared. Within only a couple of minutes, the nimbler and more agile Santelli junior had inflicted a cut to Cotronei’s face and the duel was over. Although Cotronei was known for his temper - he fought at least six duels in his lifetime - he and Santelli were said to have been reconciled when they met again at the 1932 Olympics in Los Angeles and subsequently became friends. Santelli’s home village of Carrodano is in the province of La Spezia, a port city of 94,000 inhabitants and Liguria’s second city after Genoa. The home of Italy’s largest naval base and a major commercial port, tucked away in a sheltered gulf, La Spezia is so close to the ruggedly beautiful stretch of coastline known as the Cinque Terre, not to mention the picturesque fishing village of Portovenere, that it tends not to be regarded as a tourist attraction. 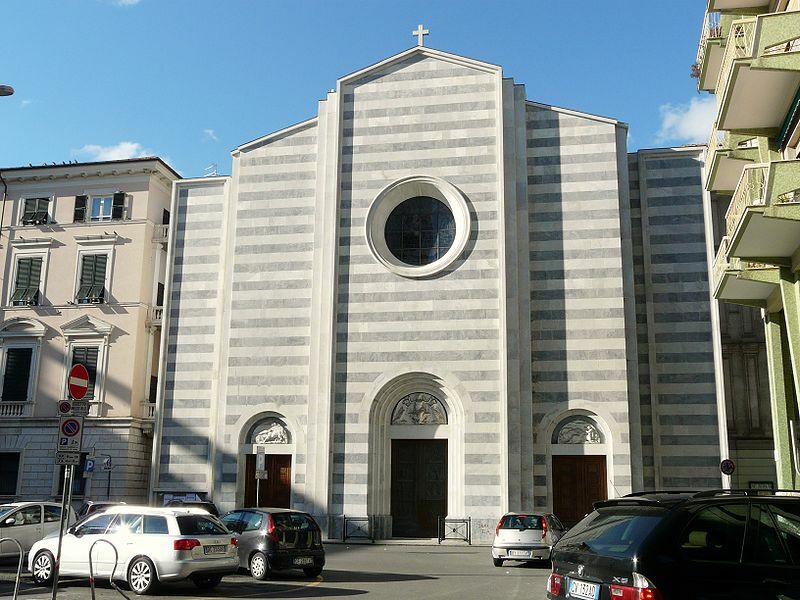 Yet La Spezia has an atmospheric historic centre of narrow streets, not to mention the recently restored 17th century castle and the impressive black and white Carrara marble of the Abbey Church of Santa Maria Assunta. 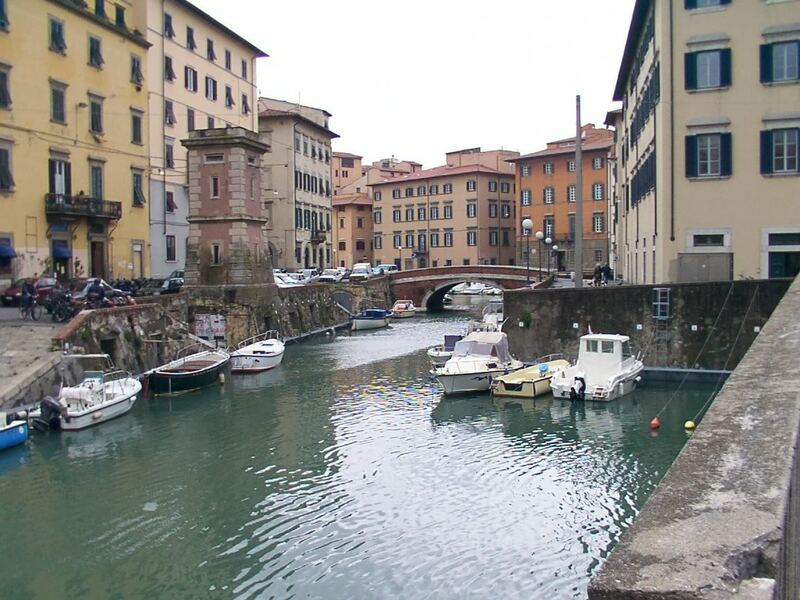 Santelli spent his final days in another of Italy’s northern Mediterranean port cities, Livorno. The second population area in Tuscany after Florence, Livorno has a population of almost 160,000. Although it is a large commercial port with much related industry, it has many attractions, including an elegant sea front – the Terrazza Mascagni - and an historic centre – the Venetian quarter – with canals, and a tradition of serving excellent seafood. The Terrazza Mascagni is named after the composer Pietro Mascagni, famous for the opera Cavalleria Rusticana, who was born in Livorno.